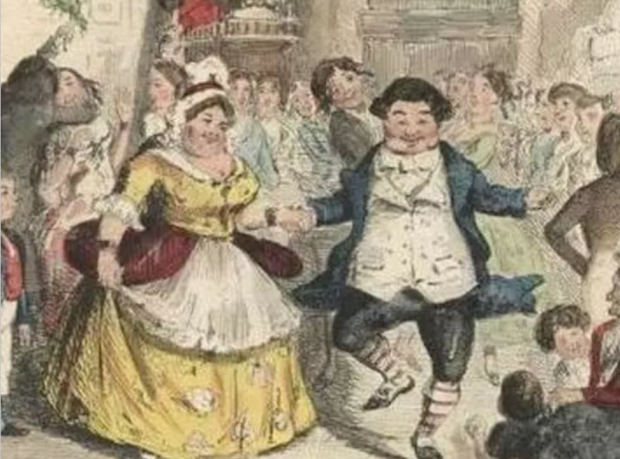 Did you know that the classic Christmas dinner was inspired by Dickens? Mr. Fezziwig’s Ball from A Christmas Carol by Charles Dickens. Hand colored etching by John Leech. Charles Dickens popularised the traditional, English Christmas in 1843 in his novel A Christmas Carol, when Bob Cratchit and his family sit down on Christmas Day to eat a dinner of goose with mashed potatoes and apple sauce accompanied by sage and onion stuffing and followed by Christmas pudding. It’s a vision that is watched – unseen by the Cratchits – by a fast-repenting Ebenezer Scrooge and the Ghost of Christmas Present who is showing the miser the error of his ways. Duly chastened by his supernatural experience, the newly festive Scrooge sends over, on Christmas morning, a turkey that is “twice the size of Tiny Tim” – and will certainly feed more people than the goose. This set the seal for the popular English Christmas meal. But what did people eat at Christmas time before goose and turkey? In the anonymous late 14th-century poem Gawain and the Green Knight, Gawain is served “many delicacies” on Christmas Day in the castle of Sir Bertilak, but no meat in the meal he eats on Christmas Eve, which was a time for fasting. Of course the poor would have eaten what they could get, including scraps from their master’s table if they had access to them. Pig, veal, goose, and capon, and turkey well dressed. Potatoes – a product of the New World, like the turkey – were not a regular feature of feasts until the middle of the 17th century. Even then they remained expensive – which is why bread and pies dominate in descriptions of Christmas foodstuffs before Dickens. Vegetables are rare in descriptions of early feasts, and do not feature in the Cratchit Christmas dinner. The Brussels sprout – a member of the cabbage family, specially developed by 16th-century Belgian farmers – may have become a staple of the modern Christmas dinner in part due to fashion and an increasing awareness of nutrition, and the fact that cabbage had a reputation since ancient times of preventing drunkenness. Robert Herrick’s Ceremonies for Christmas (1648) urges “merry, merry boys” to bring in the Christmas log and to consume strong beer and white bread “while the meat is a-shredding / For the rare mince-pie”. The yule log would have been lit on Christmas Eve; the modern confection of sponge and chocolate is a nod towards this old tradition. On the contrary, mince pies used to be savoury – in Hannah Woolley’s popular cookbook of the time, The Queen-Like Closet (1670), there is a recipe for “good minced pies” containing veal. Puddings too were often savoury, similar to haggis – although it is the sweet plum pudding that would become the traditional Christmas pud. Yet for the Elizabethans, and subsequent generations too, Twelfth Night (January 6) rather than Christmas Day was the main focus of revelry during the Christmas season. In Shakespeare’s Twelfth Night (first performed around 1602) Sir Toby Belch evokes the historical figure of the Lord of Misrule. When Sir Toby mocks Malvolio’s puritanism with “Dost thou think because thou art virtuous there shall be no more cakes and ale?” he anticipates the banning of such food during the English Commonwealth of 1649 to 1660. Herrick’s poem Twelfth Night, or King and Queen (1648) describes the Twelfth Night Cake – a spiced fruit cake containing a bean and a pea that represents the king and queen with the recipients of each being crowned king and queen for the night. Herrick’s “bowl full of gentle lamb’s wool” (hot ale, roasted apple pulp, and spices) is used to wassail (toast) the pretend king and queen. Samuel Pepys makes several references to Twelfth Night Cake in his diary, including an entry for January 6 1668 where he describes “an excellent cake” that cost him nearly 20 shillings – about one day’s salary from his job as Clerk of the Acts at the Navy Board. Twelfth Night remained the focus of festivities during the Regency period and Jane Austen would have been familiar with the eponymous cake. She also mentions Christmas in her novels but does not specify the Christmas Day meal. In Emma, there is a Christmas Eve dinner at Randalls, the home of the Westons, where saddle of mutton is served, and in Persuasion, a visit to the Musgroves during the Christmas holidays reveals tables “bending under the weight of brawn and cold pies”. Brawn here indicates a dish of meat from the head of a pig set in its own jelly and so harks back to the boar’s head from medieval times. The closest most of us get to Boar’s Head these days is likely to be a pub whose name commemorates it. So we can largely thank Charles Dickens, who was himself very fond of turkey, for the tradition of the Christmas Dinner turkey – a gift from the newly reformed Scrooge, which now forms the centrepiece of most Christmas tables.